I just shared some of my geeky transportation-themed vacation photos with work, and suddenly felt inspired to have a photo contest of babies on transit. Who else out there takes their peanut on the bus, train, ferry, or subway and has photographic evidence? 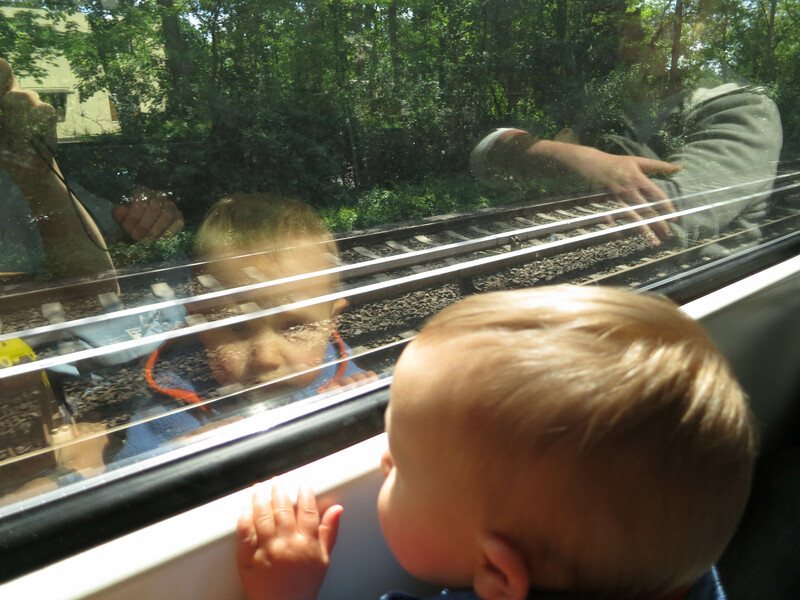 And more importantly, whose transit baby photos are the cutest? Well, it’s time to find out! You and your baby are invited to submit a photo by June 30th for consideration in the first ever Transit Baby Photo Contest. I will enlist the help of my expert judges (TBD, I just thought of this five minutes ago) and evaluate all submissions based on the following categories and contest rules (after the break). Got a category to suggest? Lemme know, I might add a few once I think about this for more than five minutes. There must be a baby, defined as a human child under two years of age, in the photo. The photographer must be the parent, guardian, childcare provider, or other close relative of the baby in the photo (or one of them, if there are multiple babies in the photo). If you’re a professional photographer, bonus for you, but no hiring someone for a photo shoot of your baby on Muni (like anyone would do that? but just in case). Photos must have been taken on or later than July 1, 2007. No sending in your own baby pics, people!! The photographer must agree to allow photo to be posted on this blog. Ideally, you’d also allow the photo to be used by TransForm (a transit advocacy group and my employer) for public advocacy purposes. But I won’t exclude you if you don’t want TransForm to have access to your photo photo. Max 5 submissions per photographer/contestant. Please, don’t send HUGE files – I’m not going to print these, so the resolution doesn’t need to be super high, just good enough to look good on a 13 inch screen. I reserve the right to create new rules if I think of any, so check back before you send your photo in. PRIZES!! There must be prizes, it’s a contest! Top photo in each category will win a fabulous prize for your child, TBD. Since the babies featured in the photos could range from 0-7 years of age, I’m not going to promise something specific right now – I won’t give your 3-month-old a model rocket kit nor your 6-year-old a rattle. We’ll figure it out and it will be awesome. Top photo overall will win a transit pass of some sort, TBD and relevant to where you live. Okay. That’s the plan. Now go forth, ride transit with your baby, and send me the evidence. Get creative. And spread the word! !